Survivors of the Las Vegas mass shooting are coping with the trauma, while calls for tighter gun control grow louder. LAS VEGAS -- The Las Vegas gunman transferred $100,000 overseas in the days before the attack and planned the massacre so meticulously that he even set up cameras inside his high-rise hotel room and on a service cart outside his door, apparently to spot anyone coming for him, authorities said Tuesday. Meanwhile, investigators are taking a harder look at the shooter's girlfriend and what she might have known about the attack, with the sheriff naming her a "person of interest" and saying the FBI is bringing her back to the U.S. on Wednesday for questioning. The death toll rose to 59 people, not including the shooter, after Sunrise Hospital and Medical Center said another person died Tuesday afternoon. No details about the person were released and the hospital said it still had 31 people in critical condition. Initially, Clark County Coroner John Fudenberg revised the death toll down to 59 at a Tuesday evening press conference, saying the total of 59 previously reported did include the shooter, 64-year-old Stephen Paddock. Including Paddock, 60 people died. Authorities are still trying to determine Paddock's motive for the deadliest mass shooting in U.S. history. As for what may have set Paddock off, retired FBI profiler Jim Clemente speculated that there was "some sort of major trigger in his life - a great loss, a breakup, or maybe he just found out he has a terminal disease." Elisha Seng can't stop watching. "I keep seeing the image of her face, grasping her neck and trying to gasp for air," she said through tears. "It was traumatic." Her mind won't disengage. Her body can't relax. "Certain parts of the day, my body just starts shaking," Elisha said. Sunday night on the Las Vegas strip, Elisha and her husband Mike returned to see Jason Aldean. They were feet from the stage, with friends they'd brought from Illinois alongside new friends they'd made during the festival. Mike became her human shield. "He covered every inch and every time the shots started I felt his body tense. I just kept asking him, because he wouldn't talk, 'Are you berathing?' He was like, 'I'm ok, I just want to make sure we get out of here,'" she said. They did, and into the safety of a hotel room with a generous stranger. "It was a mom and daughter, and I have a daughter," Elisha said before breaking down in tears. "I kept asking her to come and I'm glad she didn't." Her husband's clothes are still stained. "Just blood from other people that were by us," she said. She won't get rid of their bracelets, which served as their ticket in. "Just because we got out," she explained. "We're lucky." It was the deadliest mass shooting in modern U.S. history, with at least 59 killed and 530 injured, some by gunfire, some during the chaotic escape. Scores remained in critical condition Tuesday. 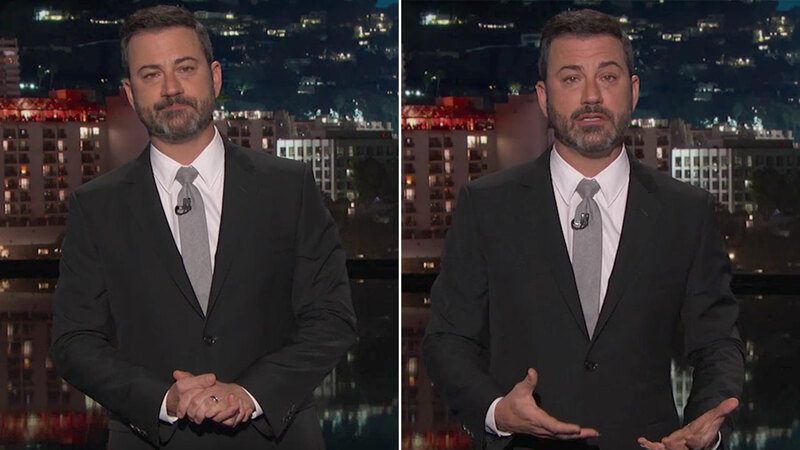 Las Vegas native Jimmy Kimmel was both visibly shaken and determined to send a message during an emotional monologue Monday night. Amy McAslin and roommate Krystal Goddard dived under a table as gunfire rained down on fellow concertgoers in Las Vegas on Sunday night. Eventually, McAslin realized she was being shielded by someone who'd just been shot. A son remembered a mother's laugh. Elementary school employees wore red, white and blue to honor a beloved receptionist. A wife recalled her husband's ultimate devotion: losing his life to protect hers by diving over her while bullets flew. Families and friends mourned - and celebrated - on Tuesday the lives of at least 59 people who died when a gunman opened fire on a concert in Las Vegas Sunday night. Laurie Beaton was at the festival with her husband Jack celebrating their 23rd wedding anniversary when they heard what sounded like firecrackers. Like everyone around her, she was looking around to see who was lighting them when she felt something like air rush past her arm. "I've never experienced gunshots but when I felt air go right past my arm I told my husband, 'I don't think that's fireworks,'" she said in a telephone interview from her home in Bakersfield, California. "He told me, 'Get down, get down, get down,'" and put his own body on top of hers for protection, she said. "He told me, 'I love you, Laurie' and his arms were around me and his body just went heavy on me." Suddenly, she knew her husband had been shot. "I screamed his name and he wasn't answering me, there was a lot of blood," she said. Another man, someone who told her he was a nurse and an EMT, ran up and told her to put her husband on his side. 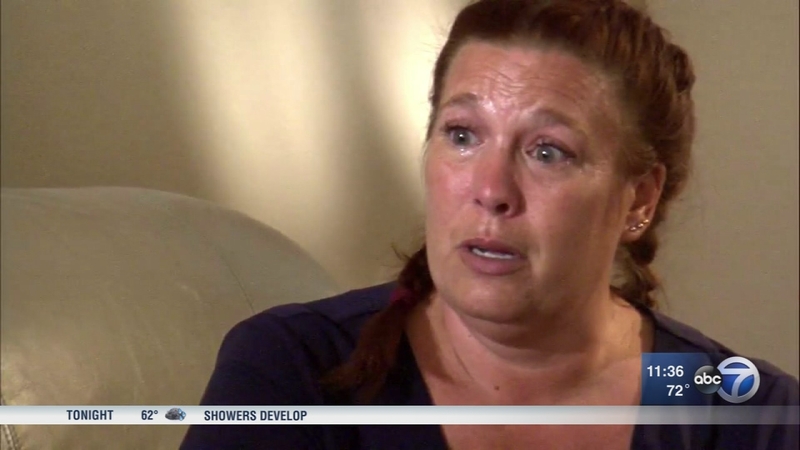 Helping, she saw blood and heard her husband struggling to breathe. As quickly as the shooting stopped it started again and now, with lights on, the man told one of the husband's friends who attended the festival with them to take the women to safety. "So we ran," she said. Later, friends told Laurie Beaton wasn't on the ground anymore. "He had been moved so we were optimistic that he'd received help,' she said. Calls to hospitals in search of Jack Beaton turned up nothing. Eventually she called the coroner's office, which said her husband was among the dead. On Tuesday morning she was back home, trying both to comfort a 20-year-old son and an 18-year-old daughter who had just lost their father and be comforted by them. Beaton said her husband, a 54-year-old construction worker, wouldn't want much said publicly about his death. But she wanted people to hear how he had protected her, just as he always had done. "I knew every day that he would protect me and take care of me and love me unconditionally, and what he did is no surprise to me, and he is my hero," she said. Quinton Robbins was the big brother who coached his little brother's flag football team, the prom king who was nice to everyone regardless of their high school social standing, an outdoorsman who loved to fish and boat around the lake. "The kid was loved by everyone," said his uncle, Mike Wells. "He was popular in high school, but would walk up to the kid who wasn't so popular and befriend him and make him feel good." Robbins, 20, was among the people killed Sunday in Las Vegas. He died moments after a bullet struck his chest and exited through his lower back. Robbins was up on his knees, looking for a spot to take his girlfriend for shelter, when he was hit, said Wells, recounting Robbins' girlfriend's account of the terrifying moments. "He died probably within seconds after the bullet hit him," Wells said. His parents sat beside Robbins, who had already died, until about 5 or 6 in the morning, Wells said, before rushing home to make sure they could tell his 11-year-old brother the news themselves. Robbins was an active member of the Mormon church and had hoped to go on a mission before he was diagnosed with diabetes several years ago, Wells said. He worked for the athletic department in his home city of Henderson, Nevada. "The positive impact he had on everyone was huge," Wells said. Heather Warino Alvarado made the three-hour drive from her southern Utah home to Las Vegas to get away for the weekend and take her daughter to a country music festival. Her daughter was unharmed in the Sunday night shooting, but the 35-year-old Warino Alvarado was one of at least 59 people killed when a gunman opened fire at the concert-goers. Friends and family received confirmation she had died Monday night from Las Vegas police, according to a news release Tuesday from the Cedar City Fire Department, where her husband was a firefighter. Warino Alvarado ran an in-home day care center in Cedar City, Utah, and was a devoted wife and mother of three children who was always willing to help others, said longtime friend Megan Jackson Gadd. As Jeff Rees thinks about his mom, Denise Cohen, one thing keeps repeating in his head: Her laugh. "When she would take me to the movies as a kid, I was just waiting to hear her laugh because it would just crack me up," Rees said. Cohen, 58, and her boyfriend Derrick "Bo" Taylor, 56, both died at the Las Vegas concert. Taylor was a lieutenant in the California Department of Correction and Rehabilitation. He worked as a commander at the Ventura Conservation Camp, which houses inmates that help California fight wildfires. Rees met Taylor last year, when he traveled to California to visit his mother. The two had dated on and off for several years. "I feel sorry for all of the people in the world who never got a chance to meet her," he said. Steven Berger, of Shorewood, Minnesota, traveled to Las Vegas as he had many times before with his friends, but this time they would celebrate his 44th birthday. A fan of country music, Berger and his roommate along with four others were enjoying the Jason Aldean show near the Las Vegas strip when the rain of bullets began from the 32nd floor of a nearby hotel. Mary Berger, 72, of Brookfield, Wisconsin, said her son's roommate called hours later to tell them Steven had been hit by gunfire and collapsed to the ground. "He tried to go to him but they were trying to get people out of the way," Berger said. He wasn't sure where Steven wound up, she added. Steven's father, Richard Berger, said the family was notified by the coroner's office in Las Vegas on Tuesday afternoon that he had died. "He's our only son," Berger said choking up. "It's terrible. At least now we know. Now we got busy things to do with three grandchildren." Mary Berger described her son, a father of three, as fun-loving with a serious side and a hard worker. He played basketball in high school and college before he started his career as a financial adviser after graduating from St. Olaf College in 1995. Christiana Duarte, 22, had just taken her first job, working in marketing for the Los Angeles Kings after graduating from the University of Arizona. "It's just so tragic that this evil, evil man would do this, would just destroy the life of this beautiful young woman," said Danette Myers, a coworker of Duarte's father, Michael, at the Los Angeles County District Attorney's Office who is acting as a family spokeswoman. "She would've given so much to this world, and now that's been cut short." She was the only daughter in a well-known Los Angeles family. Her father, Michael Duarte, is a deputy district attorney, and her older brother, also Michael, is a prospect for the Chicago White Sox baseball team, Myers said. Ariel Romero, the younger Michael's girlfriend who was with Christiana at the concert, is still in the hospital recovering from her own gunshot wounds and still doesn't know Christiana is dead, Myers said. "This is as tragic as it gets," Myers said. A one-time high school cheerleader who loved country music, Bailey Schweitzer of Bakersfield, California, went to the Route 91 Harvest Festival to see some of her favorite acts. A day after the 20-year-old's death, co-workers at the software company where she worked held a vigil. Friends and colleagues gazed at white candles lit in her memory Monday night. "No one could possibly have a bad day when Bailey was around," said a statement by Fred Brakeman, chief executive officer of Infinity Communications and Consulting, Inc., where Schweitzer was a receptionist. "If you have ever called or visited our office, she was the perky one that helped direct you to the staff member you needed," he said. Schweitzer graduated in 2015 from Centennial High School, where she was a member of the cheerleading squad. On social media she often posted photos from Bakersfield Speedway, a dirt auto-racing track that her family owns. Thomas Day Jr. was a big country music fan, so there was no doubt he'd go to the Route 91 Harvest festival in Las Vegas, and that he'd take his whole family with him. Day, 54, of Corona, California, was one of 59 people killed by a gunman who sprayed the concert with bullets from the 32nd floor of the Mandalay Bay Resort and Casino. "He was just a fun-loving boy, a great family man who loved to spend time with his family," said Thomas Day Sr. who spoke on the phone, surrounded by his son's four grown children at his Las Vegas area home. The elder Day, who lives near Las Vegas, said he was at home Sunday night when he received a frantic telephone call from his grandson and a granddaughter. "They were standing right there and they said he and another young man there both took a bullet in the head," said Day, 75. "Everybody started running for cover and the guy kept shooting." Day said none of his grandchildren were struck by bullets, but his son was. A friend rushed Thomas Day Jr. to a hospital but there was nothing doctors could do. Struggling to speak, Day said his son loved his three daughters and son and his two grandchildren. The whole group jumped at the chance to drive to Las Vegas for the show. "We always had fun together," he said. Stacee Etcheber of Novato, California, was listed as missing for hours before her family found got the worst possible news: The mother of two was dead. At the concert, her husband told her to hide, then to run, as he helped a concertgoer next to him who had been shot, said Al Etcheber, her brother-in-law. Her husband, Vincent Etcheber, is a San Francisco police officer, and his training kicked in immediately when shots rang out, Al Etcheber said. He told Stacee and the couple's three friends to protect themselves behind a nearby barrier. Then he told them to run, just before the second round of shots rang out, Al Etcheber said. He has not heard from Stacee since, and she was not carrying an ID. "It's been a grueling 15 hours with no information," Al Etcheber said Monday. On Tuesday morning, he posted on Facebook that the worst fears had been realized - she was dead. Stacee, 50, worked as a hairdresser. Al Etcheber called her a loving wife and great mother who was "tough as nails and just the salt of the earth." Jennifer Topaz Irvine, a 42-year-old San Diego lawyer, was "bright, brilliant and could talk to millennials," her publicist Jay Jones said. When Jones heard that Irvine was among those killed at the Las Vegas concert, he said it was "like an atomic bomb went off in my heart. I just got punched dead in the gut." Kyle Kraska, a sports director for the CBS affiliate KFMB-TV in San Diego, was a close friend of Irvine's and posted on Facebook that she was singing and dancing to country music when she was shot in the head. Kraska - who survived after being shot multiple times outside his home in 2015 by a house painter - wrote that Irvine's death felt like "I have now been victimized by gun violence twice." Bobby Parks' wife was planning to throw him a 40th birthday party next week before Jenny Parks was killed at the concert, friend, Jessica Maddin said. The couple who were high school sweethearts have two children. Jenny Parks was a kindergarten teacher for the Lancaster School District in California. Bobby Parks was shot in the arm and hand, Maddin said. Maddin met Parks while working at 24 Hour Fitness. Later Parks would help Maddin who started a group, Jessica's Hope Project, that provides care packages to troops. "It breaks my heart," Maddin said. "People go to concerts to have a good time, connect with others and escape the tragedies of this world." Neysa Tonks' employer remembered her as a "great mother, colleague and friend." The 46-year-old mother of three boys worked for the Las Vegas office of Technologent Inc., which offers technology solutions to companies. She was killed in the shooting rampage at the concert. "Neysa has brought so much joy, fun and laughter to Technologent - she will be greatly missed by all!" said a statement posted by the California-based company. The company has set up a GoFundMe page to raise funds to help her family. Tonks grew up in Utah. Her brother, AJ Yerage, told the CBS affiliate in Salt Lake City that he felt "lucky" that Tonks was a part of his life and that she loved making jokes. "I can hear her laugh, her voice in my head and my heart right now," Yerage told KUTV. Andrea Castilla was so happy to be in Las Vegas celebrating her 28th birthday. She was holding hands with her sister while watching the band when they heard yells to "duck!" and the sound of gunshots, her aunt, Marina Parker, wrote on a GoFundMe memorial page to raise money for the funeral expenses. Her boyfriend, sister and friend tried carrying her to safety while dodging bullets and managed to get her over a fence and to a nearby highway, where they flagged down a passing driver, who took them to a hospital in the back of his truck. After she was admitted, they were told hours later that she had died, Parker wrote, but the hospital system listed her still as alive because she was confused with another patient. "It has been tragic for our family with her dad still hoping it was a mistake and she's still alive," Parker wrote. After the family provided her ID and photos she was confirmed to be among the dead. "Our entire family is heartbroken," Parker wrote on her Facebook page. Kelsey Meadows, 28, loved children so she returned to her small hometown of Taft, in the eastern part of California, to teach at her alma mater, Taft Union High School, after earning her degree. Meadows was a regular substitute teacher at the school. "Kelsey was smart, compassionate and kind. She had a sweet spirit and a love for children," Taft Union High School principal, Mary Alice Finn, said in a statement. "Words cannot adequately capture the sorrow felt by her students, colleagues and friends in learning of her passing." The school district said grief counselors were being made available to students and staff to "assist in coping with the incomprehensible loss." Her brother, Brad Meadows, posted on his Facebook page that his sister had not been heard from since going to the music festival in Las Vegas. The California firefighter thanked everyone for helping them try to find her. "So it is with an absolutely shattered heart that I let everyone know that Kelsey did not survive this tragic event," Meadows posted Tuesday. "Please keep my family in your thoughts and prayers as we try and move past this horrible time." Maribel Ramirez had 30 minutes to go on her shift as a receptionist in Fontana, California, and decided to log onto Facebook. That's how she learned that her 26-year-old cousin, Melissa Ramirez, had been at the Route 91 Harvest Festival in Las Vegas. That was about 4:30 p.m. Monday. No one could find Melissa in the confusion and chaos that followed the shootings. "Nothing was confirmed, and we still had hope that she was alive," Maribel Ramirez told The Associated Press Tuesday. Melissa's parents and siblings hurried to Las Vegas from Littlerock, California, after getting word of the shootings. "I'm sure she liked country music. I know she was really into music, period," Farnetti said. "I never once saw her in a bad mood or upset about anything. She was always positive. Her smile would just brighten up everyone's day." Members of the Shippensburg Greyhound Wrestling team in southern Pennsylvania are raising money to help the family of coach Bill Wolfe, who is among the dead in Las Vegas. A page established to accept donations for Wolfe's family quickly exceeded its goal of $10,000 after being shared hundreds of times on social media, and team booster club said it also was accepting checks to help with family with unexpected expenses. Wolfe initially was listed as missing Monday until his death later was confirmed. As an engineer, Wolfe spent several years working on major projects for a central Pennsylvania engineering firm. There, a colleague remembered him as being personable, easy to work with and a devoted Christian. Company owner Carl Bert said Wolfe was a close friend and "a class act in every way." The Chambersburg Public Opinion reported that Wolfe and his wife Robyn were celebrating their 20th wedding anniversary in Las Vegas. Angela "Angie" Gomez died in the Las Vegas shooting, according to a statement from the Riverside Unified School District in California. Gomez graduated from Riverside Poly High School in 2015, where she was a cheerleader. School staff remembered her as a "fun-loving young lady with a great sense of humor." Gomez participated in the Riverside Children's Theater and was involved in choir. The school district said Gomez was a hard worker who "always challenged herself academically." Friend Lupe Avila wrote in a tribute to Gomez online that she was a "cheerful young lady with a warm heart and loving spirit." Vista Fundamental Elementary in Simi Valley, California, is large as schools go with 681 kindergarteners through sixth graders and receptionist Susan Smith was in the center of it all. "She's the hub," Simi Valley Unified School District spokeswoman Jake Finch told The Associated Press Tuesday. "She supported the principal, taking care of the many things that happen in the school. She was patient. She was kind, especially with the kids. Even when it was chaotic she would smile." Smith also was very patriotic, Finch added. "Today (Tuesday) everyone at the school is wearing red, white and blue in her honor," Finch said. Smith, 53, of Simi Valley, was office manager at Vista Elementary for the past three years. She had been with the district since 2001. "She was a big country music fan," said Finch. Priscilla Champagne on Tuesday described 42-year-old Rhonda LeRocque to reporters as a kindhearted woman with a "beautiful life." LeRocque had attended the concert Sunday with her husband and their 6-year-old daughter. LeRocque's daughter was taken back to their hotel before the shooting occurred. Champagne, who is LeRocque's mother, says LeRocque's husband, Jason, was next to her when she fell. He had thought she was ducking but she did not get up. Champagne says LeRocque loved cooking, music and her family. She worked at the Cambridge, Massachusetts, office of the design company IDEO. LeRocque was from Tewksbury, Massachusetts, a town located about 24 miles northwest of Boston. Tara Roe Smith, who was 34 and lived in Okotoks, Alberta, was in Las Vegas with her husband, Zach, for a weekend getaway. Her aunt, Val Rodgers, says Roe Smith, a mother of two, died when a gunman open fire on the crowd from the window of a hotel on Sunday night. Two other women from Alberta - Calla Medig and Jessica Klymchuk of Valleyview- also died. Medig, 28, who grew up in Jasper, had taken time off from her job at Moxie's restaurant in west Edmonton to attend the Route 91 Music Festival in Las Vegas, said her boss, Scott Collingwood. "This had started to become an annual thing for her. I believe it was her third trip," Collingwood said. When news broke about the shooting Sunday, Collingwood said he immediately called Medig, It went right to voice mail, and she didn't answer texts or Facebook messages. Klymchuk, 28, was a mother of four who lived the northwestern Alberta town of Valleyview, where she worked as an educational assistant, librarian and bus driver at an area Catholic school. St. Stephen's School was planning a candlelight vigil for her on Tuesday evening. A family friend has set up a crowdfunding page to support Klymchuk's children. "Jessica was an amazing mother who worked to provide her children with as best a life as she could," Noella Marie wrote on the GoFundMe page, adding Klymchuk was engaged to the "love of her life", Brent Irla. The 22-year-old sister of White Sox prospect Mikey Duarte, who is also the cousin of former New York Yankee Brandon Laird, Christiana Duarte, was killed in the mass shooting in Las Vegas. The sister of a Chicago White Sox prospect has died after going missing in the Las Vegas shooting's aftermath. Japanese media report that Brandon Laird, who now plays third base for the Hokkaido Nippon Ham-Fighters in Japan, is related to Duarte, 22, of Torrance, California. Friends on social media described her as a recent graduate of the University of Arizona. Laird will leave for the United States on Wednesday. He also played for the Houston Astros before coming to Japan in 2015. "He is a guy that could always put a smile on your face ... after all the stuff he had been through," said David Harman, who founded a company that owns the Colorado gym where Roybal worked. Harman said Roybal served in Afghanistan and was coping with the loss of a friend who was killed by an improvised explosive device. Roybal adopted his friend's bomb-sniffing dog, Bella, but was devastated when she died of old age. Roybal's co-worker, Robert Alexander, said he fell asleep with the television on Sunday night and awoke to the sound of gunshots coming from the speaker. When he remembered that Roybal had gone to Las Vegas for his birthday, he immediately called him but no one answered. Troy Rhett, another friend of Hartfield's through football, said he knew from social media that Hartfield was attending the Sunday concert. When he heard about the shooting, he texted him, hoping to learn Hartfield was safe. He never heard back, and Rhett said he learned through another friend Monday morning that Hartfield had died. Hartfield, who also went by "Chuck" or "Charles" or even "Chucky Hart," was also a military veteran and leaves behind a son and a daughter, Rhett said. Hartfield is also listed at author of a book titled "Memoirs of Public Servant" about his time as a Las Vegas police officer. Marilou Danley lived with Paddock in Nevada. Her nephew, Jordan Knights, told a CH9 reporter in Australia that he met Paddock once before, when he visited his aunt in the U.S. Knights said he was "just a normal person." "Didn't seem like he was the type of guy to do that. Just seemed like he looked after my aunty and that's it," Knights said. When asked if Paddock ever talked about guns, Knights told CH9, "No, didn't even know he knew about guns." He also said he didn't believe his aunt was involved in the attack. "I don't know. I knew that she (Danley) would have had nothing to do with it. She was nothing the person to do that," Knights said. Some people who were visiting Las Vegas when the mass shooting occurred returned to Chicago Tuesday morning. Flags were flown half-staff at O'Hare International Airport out of respect for the 59 people killed. Some travelers said they saw other concert-goers drop to the ground right in front of them. Many of those people dragged the injured to safety. Mike Anderson, of the city's Lakeview neighborhood, returned to Chicago Monday night. He was near the stage as the gunfire erupted. Anderson was not shot, but bullets struck the women in front of him. "You could smell blood from the girls bleeding in front of us. A girl right in front of me grabbing her neck. She was shot in the neck. So me and my friend, grab her, everybody hits the floor," Anderson said. Other survivors said what the public has seen on TV is just a fraction of the chaos. They said they will never forget the length of time the bullets were raining down on them, and will never get that sound out of their heads. Travelers also described the panic and confusion they experienced Sunday night. "We were locked down in Luxor for two hours. We didn't know what was happening," said David Park, a passenger. Rebecca Casey said she and a friend were planning to attend the Route 91 Harvest music festival, but decided against it last minute. During the shooting, they were placed on lockdown in a casino for seven hours. She said there were more than a dozen empty seats on their flight. "You could tell, there was quite a few people missing. They had, at one point, I'm going to say, at least ten or 15 people's names that they were calling overhead that they were missing their flight," Casey said. During the chaos, many concert-goers left bags and other behind as they fled. Las Vegas' McCarran International Airport tweeted that people can still fly home without an ID, but they will be subject to additional screening. Several flights from Las Vegas are scheduled to arrive Tuesday morning on Frontier and Spirit airlines. The shooting in Las Vegas brought a flood of emotions back for a Crystal Lake family whose son was killed the Aurora movie theater mass shooting. They hope media coverage of the events will minimize stories about the man responsible for it: the gunman. The Larimers are part of a movement among victims of mass shootings called No Notoriety, which encourages minimal attention to the gunman, who some experts believe hope for notoriety and fame. "The media spends too much time glamorizing it of sorts," said Dr. Louis Kraus, Rush University Medical Center. "The headlines, the pictures, the name in bold letters," said Kathleen Larimer, mother of Aurora victim John Larimer. "Put it in the story, but bury it down." John Larmier, who was in the Navy, died while heroically shielding his date and another man from gunfire in an Aurora, Colo., movie theater during that mass shooting. Focusing on stories like that, of heroism and hope, are what some experts said can help adults and children cope better psychologically with the tragedy of a mass shooting. Dr. Kraus said some adults might also need to consult a therapist to talk about these issues. Dr. Luis J. Kraus, psychiatrist at Rush, offers advice about how to talk to your kids about mass shootings. Republic politicians and President Donald Trump are calling for unity and prayer, but they say now is not the time to talk about gun legislation in the wake of America's deadliest mass shooting. "We'll be talking about gun laws at some other time," Trump said Tuesday morning. But the calls of "If not now, then when?" are getting louder. "When are we going to start talking about this? We have killed more people in this country with gun violence between 1970 and today than in all of our wars combined, from the revolution until now," said Mark Jones, National Law Enforcement Partnership to Prevent Gun Violence. Jones joined several others, including Cook County State's Attorney Kim Foxx, for a discussion on gun violence Tuesday. "This city is awash with guns and we seem to accept that as a truth we cannot change," Foxx said. Foxx said that apathy extends to the reaction to mass shootings. While she and other said stronger gun laws will help, the White House claims they haven't in Chicago. Jones, who is a gun owner, said it is simply not true that Chicago has the toughest laws in the country. "We have, I would say, fairly reasonable gun laws. They are not anywhere near the toughest in the nation, and should be significantly strengthened in my view," Jones said. Gun control advocates are calling for universal background checks on a federal level and, here in Illinois, licensing gun dealers. University of Chicago trauma surgeon Dr. Kenneth Wilson said it's time to treat gun violence not just as a Second Amendment issue, but as a public health issue. "We have gotten away from the right to own a gun to defend one's home. Now we're talking about the right to own a gun and kill multiple individuals," he said. Dozens in west suburban Naperville prayed for the victims in Las Vegas Tuesday night as they urged discussion about guns. While the National Rifle Association has not yet responded to the Las Vegas mass shooting, Richard Pearson with the Illinois State Rifle Association said gun legislation will not prevent any future mass shooting. Pearson said when people want to kill people there is very little you can do to stop them. Victims of the mass shooting in Las Vegas will soon be receiving visitors from the Chicago area. Lutheran Church Charities therapy dogs, each with more than 2,000 hours in training, were deployed to assist other comfort dogs that have already been sent to Las Vegas. "People need just a moment of sunshine in a terrible, terrible day," said Mike Millett of Lutheran Church Charities. "Try to bring presence, calm and prayer to those that might best use that." Once they land in Vegas, the dogs will go to the hospital, where the shooting victims are being treated. The dogs are meant to provide support, as they have for other victims in past tragedies. The bloodshed in Las Vegas has left many people wondering, "Could it happen here in Chicago?" The city's security officials said they have been preparing for that scenario. These types of mass shootings, in such an open setting, always brings safety and security to the forefront - and Chicago has taken notice. Security is a top concern as 45,000 runners descend on the city this weekend for the Chicago Marathon. Chicago Mayor Rahm Emanuel, race organizers, the FBI, Department of Homeland Security, Chicago Fire Department and Chicago Police Department met Tuesday for discuss how their plans have changed in light of the mass shooting in Las Vegas. Officials said they have had about a dozen tabletop exercises, or planning exercises, to review security protocols for the 40th running of the marathon. Authorities also said they have already put in place considerations for security issues that may arise from a Las Vegas-type attack, and have added those potential security issues to their existing emergency protocols. This event draws roughly 40,000 runners from all 50 states and more than 100 countries. While the mayor said Tuesday the Las Vegas mass shooting shows the need for national gun control, race organizers said they don't know of any runners that dropped out because of safety concerns. "Our participants are a resilient group. If you think back to our event after 9/11, when we were challenged, it was our largest participation field," Bank of America Chicago Marathon Executive Race Director Cary Pinkowski said. "I think we'll see a record number of participants on Sunday." "We run exercises all the time. That's why I want to make the point, I want to make it emphatically to you. We're not just starting this exercise today, for Sunday. We have done ten to 12 tabletop exercises since the last marathon," Emanuel said. The mayor wants to make sure participants and spectators know the plan is for everything to go off without a hitch and to be safe. Emanuel has special interest in this year's race. His son will run the marathon to raise money for hurricane victims in Puerto Rico. The mayor said Monday the city is prepared and talked about active shooter drills conducted through the year. "We increased it up to six kind-of active, scenario-based situation with an active shooter, for the type of situation that happened there. The city is prepared and doing its work," Emanuel said. Chicago police, firefighters, emergency officials and hospitals all participate in those drills. The Las Vegas shooting is the type of situation cities prepare for, but they can be difficult to prevent. An outdoor concert is considered a soft target. Security experts said it is unrealistic to secure every soft target. The shooting has added new energy to the national gun control movement, including in the Chicago area. Members of the group Peaceful Communities gathered outside a sporting goods store in north suburban Northbrook. They want gun sellers - and every other part of the weapons industry - to be held accountable for gun violence. White House Press Secretary Sarah Sanders said Monday that now is not the time for a debate on gun control, but instead it's a time of mourning. A gun store in Nevada that sold the shooter some of his weapons said he passed all necessary background checks. It is unclear whether those weapons were among those used in the Las Vegas shooting, but there is no indication that any of the weapons paddock owned, were illegal.